Since giving up coffee, unsweetened iced tea has been my drink of choice. The cheapest places to buy it typically sell a 32oz cup for 99 cents. With tax, that makes each cup $1.06. So, for Christmas, I got myself an iced tea maker. This one, to be precise. The price was slightly lower when I got it: $37.00. I found tagless black tea bags at Walmart for about $1.50 for 100 bags. The iced tea maker uses approx 8 tea bags per pitcher, and each pitcher fills my travel cup (this one) two times (with a little left over). So! Assuming two fills per 8 tea bags, that means I can get 25 travel cups of tea per 100 count box. At $1.50 per box, that means each refill of tea costs me 6 cents. 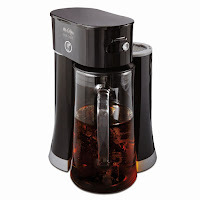 Ergo, each refill is saving me exactly $1.00, so the iced tea maker will pay for itself in 37 days, after which I will be saving a full dollar every time I make tea myself instead of buying it. Obviously, there are variables, like the cost of the water I'm using to make the tea (very tiny cost, but still there), and the cost of the electricity to power the iced tea maker (again, very small). So it's not quite as cut and dry as saving a full dollar. But hey, it's still a massive savings over buying the tea at a convenience store, amirite?